My recent New York City trip was the third trip I have made to Manhattan since going gluten-free. 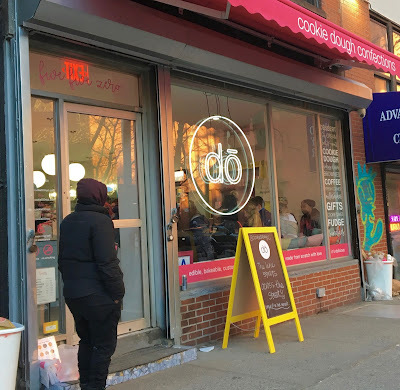 Due to the limited nature of each trip, I was not able to seek out a gluten-free bakery until now, when I wandered into By The Way Bakery in the Upper West Side. I knew By The Way Bakery was 100% gluten-free, but I was downright giddy when I found out they were 100% dairy-free. That meant I could have anything- absolutely anything- on their shelves without restriction. So often when I visit gluten-free bakeries I have a limited selection of items that are dairy-free, but not here at By The Way Bakery. 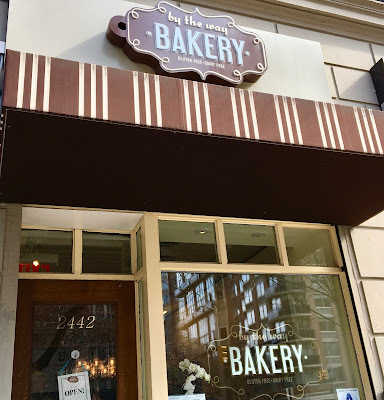 I am so thankful that I stumbled across this bakery, because it quickly became a highlight of what was a dream visit for this gluten-free foodie. As a gluten-free eater, I am used to constant vigilance. I play 20 questions at every restaurant I visit and often feel more skeptical than comfortable with the answers kitchen staff provide. I am used to navigating around typical gluten-free problem zones: shared pasta water, utensils, and free-flying flour. Italian food is the arch-nemesis of any gluten-free eater because it's basics- pasta, bread, and pizza- are all traditionally flour-based. As a dairy-free diner, I find it doubly challenging to find safe eats, because cheese tends to be as abundant as wheat flour on Italian menus. 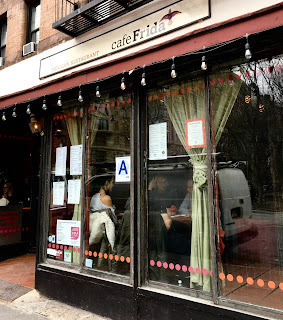 That's why when it came to deciding on my birthday dinner location in New York City, I had no hesitation in selecting Senza Gluten, a 100% gluten-free Italian restaurant in the heart of Greenwich Village. Here, celiacs can sit down to a worry-free meal, and for a rare moment let down their guard and truly enjoy the experience of dining out. Gluten-free food gets a bad rap of being a lesser imitation of gluten-containing fare, but at Senza Gluten, the food is no second-place contender. 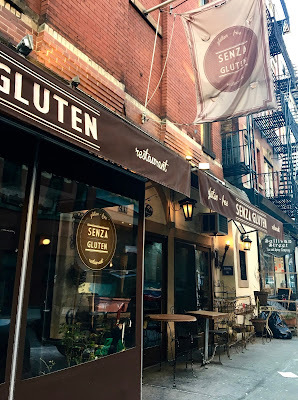 Authentic and artfully crafted, Senza Gluten offers both peace-of-mind and a culinary adventure. Planning any trip is hard- especially when making a return visit because it's tough to find a balance between returning to beloved finds or seeking out new eats. 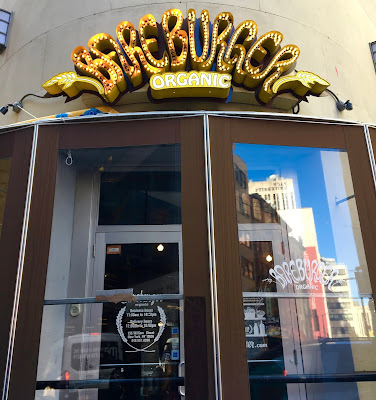 On my second day in New York City, my family decided to give BareBurger a try because it promised both gluten-free safe food and had a menu we all could agree on. Located just a few blocks from the heart of the financial district, this Bareburger location is convenient and just far enough away from the height of the hustle and bustle. Bareburger is not-your-average burger place- and definitely stands out in a city laden with burger joints ranging from cheap to high end. They believe in sourcing real, organic ingredients from local farms- something you don't often find at chain restaurants. The white whale of being gluten-free and dairy-free are safe versions of typical gluten and dairy-laden comfort foods. While a gluten-free option can be found, so often the product contains dairy (or vice-versa). As a college student, my freezer looks a bit different than others' in my dorm because mine is missing one of the staples of college life: frozen pizza. For three years now I have survived late night study sessions without frozen pizza to get me through, but at Expo East last year, I discovered a product that would change everything: Sonoma Flatbreads' gluten and dairy-free Fire-Roasted Vegetable pizza. Yes, there are other companies that have attempted the gluten and dairy-free frozen pizza, but what I've determined are the hardest parts to master is the crust and cheese. No one wants to eat a gooey, oily mess atop a cardboard crust, which I thought was the epitome of gluten and dairy-free frozen pizza. However, with Sonoma Flatbread's innovative new product, you too will join me as a believer that gluten and dairy-free pizza has finally arrived. In the gluten-free and allergy-free world, Enjoy Life Foods is a total rock star. Their products are all free from the top eight allergens, and make enjoying food non-scary. Although there are several gluten-free brands out there, few have as many options as Enjoy Life Foods with their chocolates, baking mixes, cookies, and other snacks. Their latest product launch is their ProBurst Bites, which promise the power of protein with the pleasure of chocolate- a total win/win. In four delicious flavors, they promise to be a versatile solution to your snacking needs. Made with plant-based protein, these bites may taste like decadent truffles, but they are actually good for you (at least compared to other sweets). One of the cool things about being an Enjoy Life Foods official blogger is that I have the opportunity to sample and spread the word about their new products. These ProBurst Bites are definitely a product to take note of! While I love finding good places to eat breakfast, lunch or dinner on the road, I am always on the hunt for gluten-free bakeries- but often come up short. 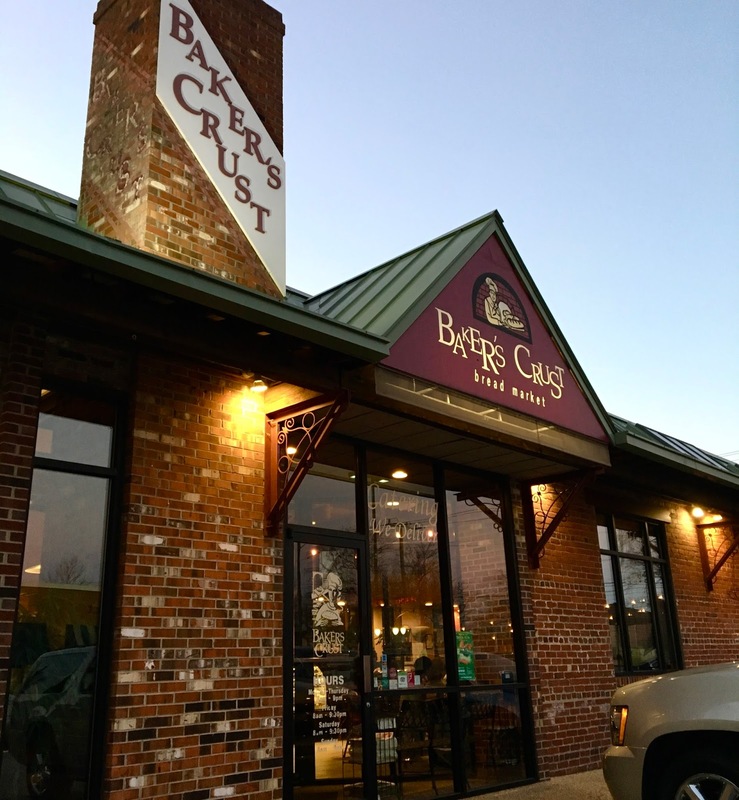 Finding safe baked goods (that I don't make myself) is the ultimate treat, and once I discovered that Food Allergy Bakery had allergen-free options, I knew I'd have to make a stop in Chesapeake, Virginia before heading back to the Norfolk airport. 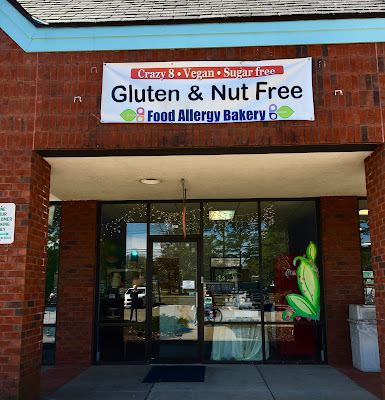 Food Allergy Bakery is an offshoot of Carolina Cupcakery, a Cupcake Wars veteran that was founded on the belief that cupcakes can both taste good and be made with real ingredients. Although housed in the same location, Food Allergy Bakery products are made in a dedicated kitchen, with rigorous protocol in place to ensure no cross contamination (including dedicated air systems). 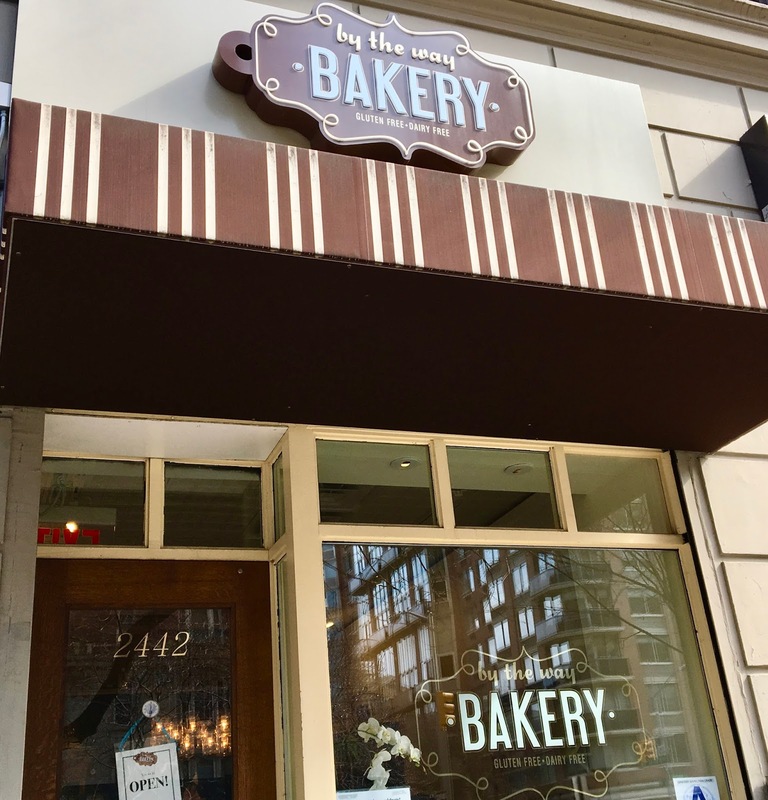 If you've been craving the experience of going to a bakery and having tons of options to choose from, read on, because Food Allergy Bakery might just be the bakery of your dreams.